EDIT: In Vietnam, 2011 is the year of the Cat. In China, its the Rabbit. Welcome Mr Cat! Welcome Mr Rabbit! Thanks for turning up when Buddha invited you to celebrate the new year. The Rabbit represents peace, harmony and inspiration. Enhancing love, friendships and solutions. In Vietnam, the new year celebrations are called 'Tết' - its a two week long holiday where everyone will bring out their best outfits, take the plastic covers off toys and furniture, fill their homes with flowers, fruits and cakes and worship to their ancestors and celebrate in a very formal and traditional way, remembering their ancestors. There are so many superstitions to follow. How your first day on the moon counteracts with how your year will be so it is made sure to be a good day. No arguments, no crying, no conflicts! But if you step on dog poo, its meant to be lucky! If you wear red, you're meant to get lucky or if you see a spider hanging, dangling in front of your eyes! You should be jumping for joy. My mum has bought us up to follow many rules and of course, as children, we were always dismissing her until she gathered the evidence, year after year, as she reflects back to the previous new year how if we had listened to her and followed the traditions, we wouldn't have ended up in love ruts, financial cuts, and fall outs throughout the year. There are signs everywhere, she believes, like an Amelie. So now I am listening, I am spring cleaning the house and have been for the past two weeks, trying to get rid of the past, in with the new, making as much order as possible to my home in order to have order (as the Snake so much likes), I've arranged for all my debts to be paid (or to have them scheduled is more realistic) but most importantly, have a feast. I will be having a 'Bánh chưng' - a traditonal Vietnamese Cake made from Sticky Rice, Yellow Beans and Pork Belly. First I will offer it to my ancestors, by displaying it next to their picture, light some incense and I will say a prayer to my family and my ancestors (my grandparents, parents of my mother). When the incense dies, I can eat it. It was invented about 4000 years ago by an Emperor, who (like Queen Elizabeth when someone found the potato) wanted a cake to reflect his world and his people. Something simple and humble yet delicious. At the time, they thought that the world was flat so they made it into a shape of a square reflecting the land and they also made a cylinder round one to reflect the skies. 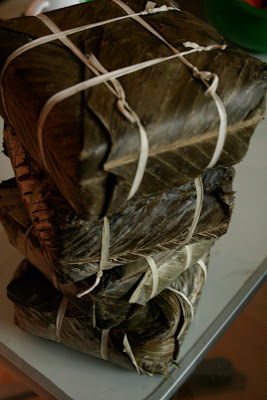 Everybody still eats this today and its the most traditional and celebrated Vietnamese cake. I have never made this cake, I will learn how to when I am next in Vietnam. Nowadays everybody buys it, it is apparently very time consuming to make. 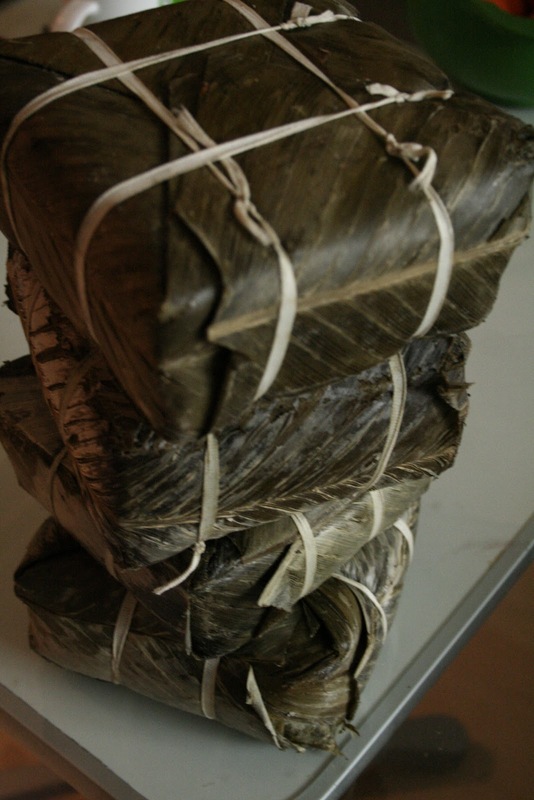 Its soaking and boiling gently for hours and hours and left for days to firm up inside banana leaf. I get it every year, and sometimes crave for it mid year and have a dribbling dream! You can buy it in Vietnamese/ Chinese supermarkets, and eat as it is or, (this is better) gently shallow fry until brown and crispy on the edges. Serve with soy and chilli sauce, some pickled shallots to cut the glutenous edge and some traditional Vietnamese ham which can also be fried. Simple, yet wonderful with a very harmonious balance. During Tet, simple foods like these are mostly eaten, peasant food such as braised pork belly in coconut juice and fish sauce with boiled eggs. But the whole time is about eating as much as you can, offering your food to the ancestors to pray that they are well feed, happy and prosperous in their new life and looking after you in this life. Vietnamese people believe that we all reincarnate, our passed mothers and fathers should never be forgotten because they live on. We must always pray to them and for they are protecting us from afar, and this only happens if the family is built on love. If no one is praying for them, or offering them any food, it is feared that they will become poor and unlucky in their new life - and no one wants that. So, as well as giving money in red envelopes to little children and presents to loved ones, friends and neighbours, many people go to get their predictions for the year, to hope for a good and better one than the last. I am the snake, the rabbit year means I am supposed to be financially rewarded, my time and life is in order and romance and friendship will be superb! whoot! There isn't a guru sitting in a hut here, you can google your predictions instead. Have a fantastic new year. Love your ancestors.